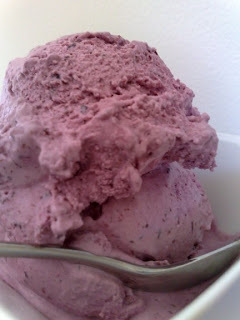 I was really excited to make icecream this week, despite the fact that it's the middle of winter here. I felt a little ridiculous actually, preparing icecream while wearing jeans, thick socks, ugg boots and 3 layers on top including a big woolly jumper. Brrrr! This week's recipe was chosen by Dolores of Chronicles in Culinary Curiosity. I have to say I loved this recipe. I tasted the blueberry/sugar/lime mix as it was simmering and it tasted like the perfect base for a cocktail! It made for a beautiful colour too. Delicious. 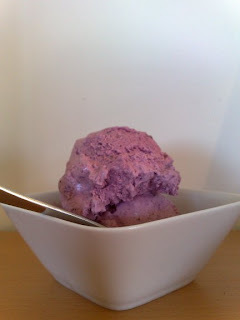 I thought it was like frozen blueberry cheesecake which can never be a bad thing! I ended up adding the juice of a whole lime and I'm glad I did because it needed that extra zing. Overall more like frozen yoghurt than icecream but big thumbs up all round. Next week we have ... Granola Grabbers (??) No idea. Will have to wait and see what that is!